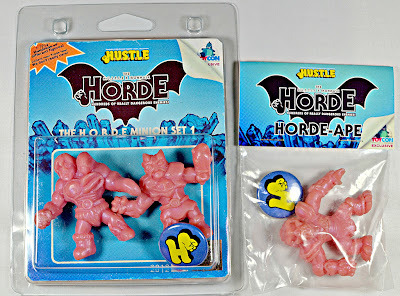 Little Weirdos: Mini figures and other monster toys: The HORDE of Weirdos Contest: Win cool toys from Ironhaus Productions! The HORDE of Weirdos Contest: Win cool toys from Ironhaus Productions! I've been meaning to run a contest through this site for a while, and kept putting it off. Well, the time has finally come. Here is the lowdown on the Little Weirdos "HORDE of Weirdos" Contest, running from now until Monday, July 29! Thanks to awesome contributions from Jimmy Rommel / Ironhaus Productions--who's been steadily cranking out top-notch toys like Universe of Violence, Gorewad Monsters, HORDE and Micro Bastards--there are some truly kickass prizes up for grabs. Make sure you are following Jimmy's blog and visiting his store often to keep up with all the creations coming out of the Ironhaus lair. 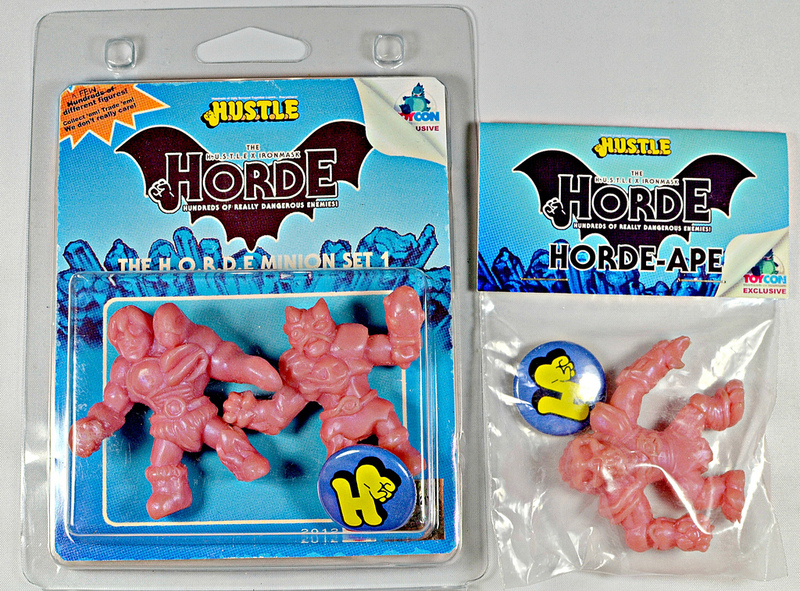 A complete set of packaged HORDE ToyCon UK 2013 exclusive figures, sculpted by Jimmy and produced by TruTek as part of the larger HUSTLE line. This includes all three figures: Horde-Ape (packaged individually) plus Mer-Mace and Man & Eel (packaged together). 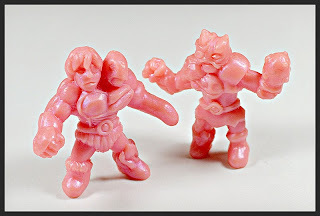 These figures are cast in a slightly pearlescent flesh/pink rubber and are all-around amazing! An assortment of four Ironhaus rubber mini monsters, pulled from Gorewad Monsters, Micro Bastards and even Jimmy's custom sculpt of an unreleased Fistful of Aliens figure, Dr. Dark! One of my personal favorite figures from the Universe of Violence line--Cedargief--in orange rubber! 1. Follow this site. If you haven't already, the first step is to click "Join this site" on the right side of this page under where it says "Followers." You need to be a Little Weirdos follower in order to win. 2. 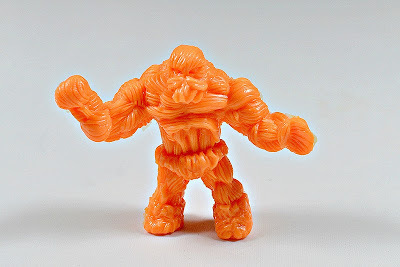 Leave a comment on THIS POST that mentions a toy line, past or present, that you'd like to see covered here on Little Weirdos. This will get you one entry into the contest. 3. BONUS: Get other people to follow this site and get them to say you sent them. For every person you get to follow the site and leave a comment on THIS POST mentioning your username to indicate you were the one who referred them, you will get one extra entry. For example, if you get 5 people to follow the site and leave a comment with your username, you will earn 5 additional entries into the contest to give you a greater chance of winning a prize! Entries will be accepted until 8 p.m. CST on Monday, July 29th. Then, I will compile all the entries and randomly select winners for the first, second and third place prizes. Results will be announced on this site on Tuesday, July 30th, after which winners will need to email me their mailing addresses. Thanks for reading and good luck to all! A toy-line to get showcased that you haven't already mentioned? This will be tough! Is something Transformers out of the question? Not out of the question at all. Even if you come up with something you don't think would be a perfect fit, it will still count. I humbly suggest a Beast Wars entry, or the Canadian Battle Beast knock offs: War Monsters! You're definitely going to want to cover the upcoming Sucklord series S.U.C.K.L.E. when they come out. They're kitschy and cool, and just about to finish being fully backed via Kickstarter. Speaking of kitschy- you should cover the vending machine phenomenon known as HOMIES! I have some Street Fighter vending bootlegs that are even smaller than the ones you have on here, I'd like more info on those! How 'bout Yolanda's Toxic Crusaders? Have you mentioned them here yet?? Good suggestions so far! Also, for anyone else going to enter, suggestions for posts on specific parts of a larger line are cool too (for example, a specific series/subset from the Monster in My Pocket line). I was hoping to see a right up on the Japanese Transformers DECOY mini figs, with the more RARER and HTF color/fig (more expensive)! Jimmy Rommel sent me here because I am friends with him on FB and he hates me (his words, not mine). Suggestions for extended/additional coverage of a line I already posted about counts too! Anything more on MIMP is always welcome. 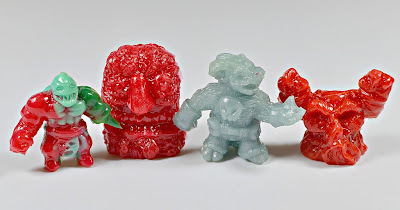 Have you covered Mini Boglins yet? They were a favourite of mine back in the day. Or Bad Eggz Bunch? Have you done anything on Snailiens? B.U.N.N.Y.W.I.T.H. get any love on this site yet? What about weirdball wrestlers I don't know if you've covered them or not. How about War Planets? Though the sets were variations of a basic model (Elemental planet,+ vehicles + infantry + heavier hitters), the little details were diverse enough to be more than enjoyable. And the premise was rather interesting. Thanks for your excellent site, I visit often and it never occurred to me to follow it. Would love to see a feature on Gamoja, a line Moose released between Fistful of Power and Trash Pack! Cool contest. I suggest some current vending machine capsule toy mini figures like Neo Neons or Buggyboos. I see you covered Dragon ball Vending Machine bootlegs, but no actual Dragon Ball Keshi. Really loving the freaks you post on this, Idk if you have before but it'ed be cool to see the mini rubber super mario figures. I got one in a trade randomly and I'm not entirely sure where they are from but its pretty amazing. Keep on Keepin on brethren! Love the site, and really excited about this contest. Those figures are really great. One figure series I don't think you've covered yet are AWA Mini Mashers. I would love to see you cover some SNK or Capcom Keshis in the near future, or perhaps even some Archer Spacemen (bootlegs, reissues or originals). I'd like to see some coverage on the Superhuman Samurai Cyber Squad figures and the old Happy Meal toys from the 80's and early 90's. Entries now closed! Thanks to all who participated. Will be doing a new post listing the winners tomorrow.